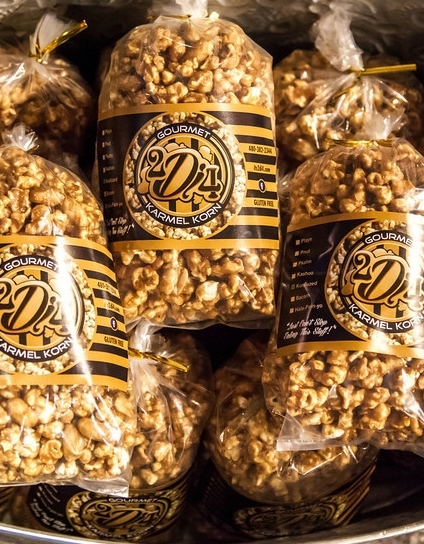 Our Sampler Pack is a delicious way to try a variety of our signature flavors! Choose five of our medium bags in any combination you'd like. A great way to indulge your curiosity, or to give gifts to as many as five people. Perhaps four gifts and one for you . . . or three gifts and two for you . . . or . . . .
Just add a Sampler Pack to your cart, and you'll be prompted to choose your flavors. More is better! Orders of $30.00 or more are eligible for a 10% discount! Just use coupon code BIGTIME at checkout. Copyright © 2011 - 2014 by 2 Di 4 Gourmet Karmel Korn. All rights reserved.